The Epitome of Class & Elegance awaits the Discerning Traveler at the Incomparable Tower – Exemplifying what Service & Luxury should be – in a Magnificent Oceanfront Setting Overlooking World-Famous Waikiki Beach. 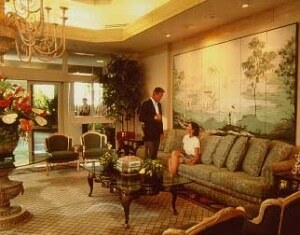 From the Moment you Arrive, you’ll be pampered with Luxurious Appointments and our Impeccable Service that is Attentive & Gracious … yet never intrusive. Our Professional Doorman greets you and On-Site Concierge awaits to assist you with your specialized Island Travel Needs…as you Stroll through our Elegant & Intimate Lobby en route to your Private Island Condo Getaway… Just Steps to the Sand. French-milled Soaps, English-down pillows, Room Service & Twice-Daily Maid Service are just a few of the Finer Touches you’ll discover from your Elegant One or 2-Bedroom Waikiki Beach Luxury Vacation Condo, Exquisitely Furnished. Lounge in Comfort & Style from the Privacy of your own Double-Sized, Tiled Lanai – Accented with Special pass-through sliding glass Serving Windows for your outdoor dining pleasure – Showcasing Breathtaking Views of Waikiki Beach framed by Magnificent Diamond Head. 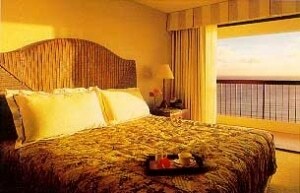 With only 4 Suites per Floor, Your Privacy is Guaranteed. 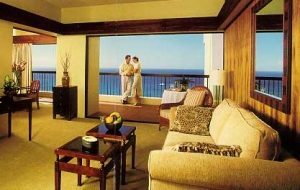 You’ll savor the Designer-Decorated Furnishings from your Elegant Hawaii Condo Vacation Rental, Featuring Mahogany accents, Separate Wet Bars, Track-Lighting, Oceanfront Master Bedroom Suites (most units), in-suite Washer/Driers, Cable TV & VCR’S. For your added Vacation Pleasure, take a Refreshing dip in the Pool, Relax in the Whirlpool, or Play a game of Paddle Tennis on our Private Court. An International Array of World-Class shops & Restaurants are Just Moments Away. Sophisticated Elegance and Impeccable Service awaits the Discerning Traveler Accustomed to the Best, in an Ideal Oceanfront Setting overlooking World-Famous Waikiki Beach…at the Incomparable Tower. Your Luxury Waikiki Beach Oceanfront Island Resort Vacation Getaway Features your Choice of Elegantly Appointed 1-Bedroom Condominium Vacation Rentals that accommodate 4 Guests. Or Sophisticated 2-Bedroom/2-Bath Designer-Decorated Hawaii Condos – Featuring Oceanfront Master Bedroom Suites (most units) – that sleep up to 6 people. All Linens & Towels provided.